Thanksgiving is almost here which marks the official beginning of the holiday season. To get an early start on your holiday shopping, Barnett Fine Art has compiled a gift-giving guide for the art lovers in your life.Our list is varied offering original paintings, works on paper, sculpture, and crystal. Avoid the Black Friday crowds and shop online with Barnett Fine Art this holiday season. Ginzburg’s work “Diaspora Mezuzah” is a stunning example of the artist’s work in acrylic sculpture. Part of his “Judaica” collection, this work is perfect for any lover of art that explores themes of Jewish culture and identity. No modern art collection is complete without a Picasso. This Picasso poster entitled “Portraits Imaginaires” is a colored lithograph with text. It is a work that can add diversity to an established collection as well as anchor a new collector. Joan Zaslow’s beautiful terracotta sculpture, “Seated Torso Study” offers a modern rendition of a classic form. Zaslow’s ability to conjure an emotional response from the viewer is on full display in thissculpture. This work is a “Unique”, there is only one. Pop Art is coveted by modern art lovers. “Fade to Closeup of Marylin” by James Gill is an excellent example of the genre. 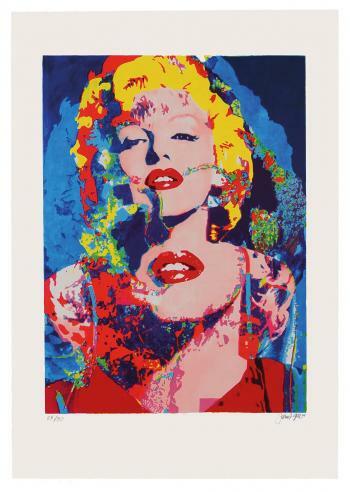 A contemporary of Lichtenstein and Warhol, Gill is one of the last living pop artists of that era. Gill’s biography is interesting and explains his position in the original group of noted Pop artists. Erteis often considered to be the father of Art Deco. The elegance of his art deco objects of art is evident in these gorgeous crystal champagne flutes. These champagne flutes are an excellent gift for any occasion: the holidays, a wedding, birthday or anniversary. A work by Peter Max, one of the most popular and influential artists of the 20th century, would excite any art lover. This original painting “Flowers on Blue Yellow and White” is an excellent example of the artist’s style and his fascination with flowers as a theme. This entry was posted on Tuesday, November 24th, 2015	at 9:05 am	and is filed under Art For Your Collection, Other	. Both comments and pings are currently closed.